The unique modern diagonal design of this Hanukkah Menorah wills stand out in any setting. The Jewish Holiday of Hanukkah will always be extra special with this Hanukkia by Hadad Bros. of Israel which weighs 245 grams. The tradition of Hanukkah melds with the modern design of this unusual Menorah to make your holiday an occasion to remember. The square base of this Menorah stands on four square smooth legs of sterling silver. The facets of the base are also in smooth silver, and then bend sharply inward, with a tiny step, to create the smooth upward flowing lines of the central column. Right above the tiny step, a band of beautifully executed etching in silver gives interest to the base, while highlighting its shiny smooth perfection. With a small curve back out, the column then bends sharply inward, topped by several small circles of silver which serve as the final base for the arms of the Hanukkia. The structure of the arms of the Hanukkia is what makes this one unique. One arm flows sharply to one side at a forty-five degree angle, and each of the eight other arms comes out of the first one at ninety degrees, all ending at the same height, to provide a base for the candle cups. The candle cups are each shaped like a chalice, with a rounded base which then flows inwards and out again. They can all hold either oil candles or wax candles. The long arm holds another chalice at a different height, serving as the base for the extra candle which is used each night for lighting all the others. The "Shamash" as this candle is called – means "caretaker" in Hebrew. 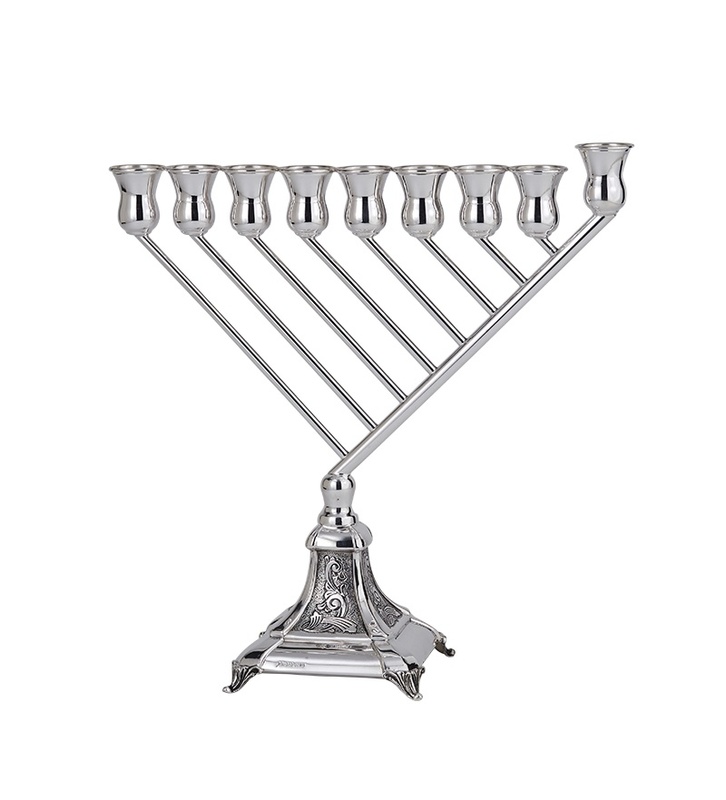 When you light one candle on the first night, and as you proceed through the nights of Hanukkah, lighting candles for all 8 days, the light of these candles will be magnificently reflected on the perfectly smooth silver surfaces of this Menorah. Give this Menorah as a present to remember, or it could also shine in your Judaica collection.